IAMS Delights Kitten – Chicken in Gravy is a balanced food, made to meet the unique nutritional needs of your kitten. By combining your kitten's favourite ingredients with vital minerals and nutrients, IAMS Delights promotes your kitten's wellbeing. These wet food pouches also contain a high content of animal protein, which helps to support healthy growth and development. This delicious recipe is based on many years of research and is suitable for kittens, as well as pregnant and lactating cats. The chunks of succulent meat in savoury gravy offer your kitten a great-tasting, wholesome meal. 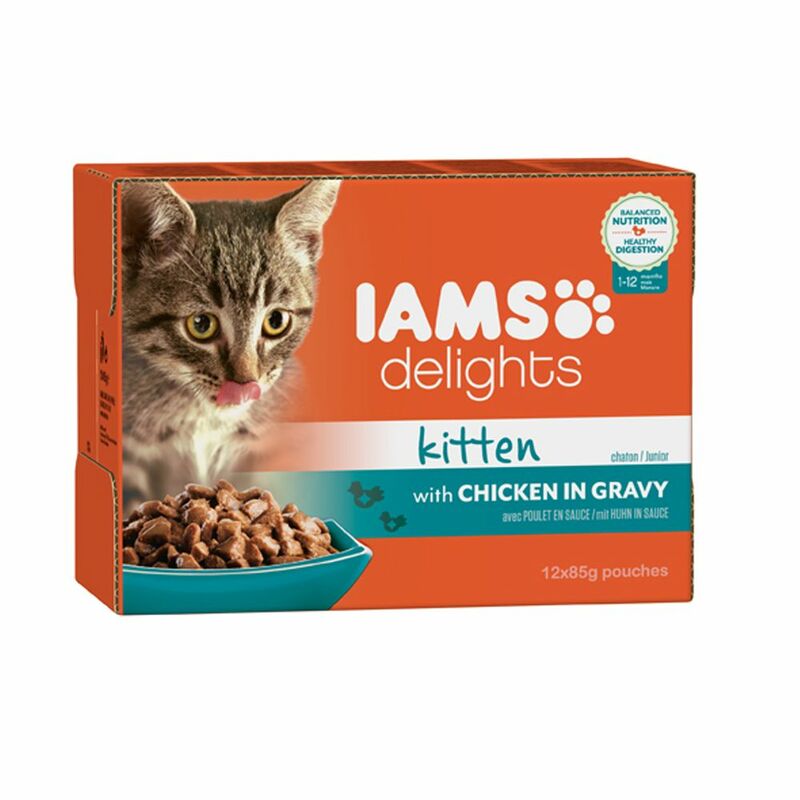 IAMS Delights Kitten – Chicken in Gravy are well-accepted, complete wet food pouches, formulated to meet the nutritional needs of kittens. These delicious pouches are easy for your kitten to digest and also help to strengthen their immune system. The balanced combination of meat, vegetables, minerals and vitamins helps to support your kitten's well-being and promotes healthy growth. Established in 1946: The founder of the company, Paul F. Iams, recognised dogs and cats primarily as carnivores; this thought came to revolutionise the whole pet food industry. Products made by IAMS are characterised by the innovative recipes, the highest level of safety and quality, and years of research. IAMS Delights Kitten – Chicken in Gravy at a glance: High-quality complete wet food for kittens, as well as pregnant and lactating cats Original recipe: based on many years of research, IAMS food helps to promotes your cat's well-being High content of animal protein: supports the healthy growth and development of your kitten Great tasting: irresistible, succulent chunks of meat in a delicate gravy Wholesome food: provides your cat with all the eΒential nutrients Easy to digest: IAMS Delights Kitten – Chicken in Gravy wet food pouches are easy to digest and helps to promote your cat's natural defences High safety standards: continuous quality control from the choice of ingredients to the packaging International manufacturer: founded in 1946, IAMS has years of experience pioneering the development of healthy, modern pet food.